Hello guys! Today I bring you two quick reviews. 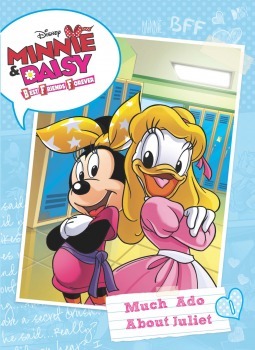 The first is Minnie & Daisy Best Friends Forever #1: Much Ado About Juliet by Calliope Glass. This is a short story about Minnie Mouse and Daisy Duck in their schoolgirl days. In this installment, Minnie wants to get the lead in the school's production of Romeo and Juliet, just so she can get near the guy playing Romeo: Paul Poser. Daisy thinks Paul is exactly that, a poser, so she's doesn't care about the play all that much but agrees to go support Minnie... but she ends up getting the part instead. From what was happening, I guess Minnie and Daisy were supposed to be high school girls (or at least middle schoolers) but this book is definitely just for kids. It was cute and I even liked the story but yeah, definitely for little kids. 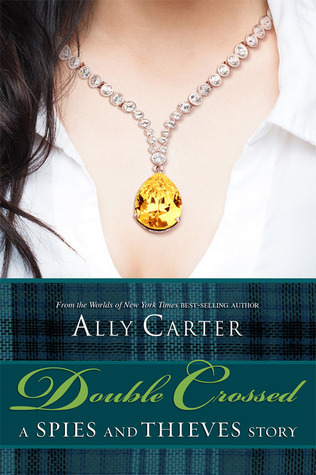 Second book is Double Crossed by Ally Carter. And well, it really isn't a book but a novella that brings together the worlds of Ally Carter's series: Heist Society and the Gallagher Girls. The two worlds collide when Macy McHenry meets Hale at a society party. One thing leads to the next and soon Kat, Hale and Macey are working together on a little project. It was a fun novella and I think the fans of both series would like it. Personally, I don't care that much for the Heist characters, particularly Kat, so I would have liked for the story to lean more on the Gallagher Girls side, but it was a good story - this quibble is entirely personal - and it sort of made me wish it was longer. One thing the story did prove is that having both sets of characters working together would be really awesome and entertaining, and that both series aren't that far removed from each other. Plus, it was nice to see Macey take a more central role.